Drs. Valeri Sacknoff, Robbi Wilson and Jason Keckley of Pomerado Cosmetic Dentistry recently partnered up with Rosemont Media to create a fully customized, user-friendly website exploring a number of general, cosmetic and restorative dentistry procedures. The new website integrates dynamic drop-down menus with detailed descriptions of services the Poway dentistry practice offers. Users are able to read in-depth biographies about the team members, look at a comprehensive smile gallery, read patient testimonials and schedule appointments online. The easy-to-navigate interface allows users to locate information they are looking for in a matter of seconds. With the addition of a social media button linking to the practice’s Facebook profile, users are able to communicate with other patients and receive updates about the practice. Our team of SEO writers and designers teamed up with the dentists to optimize content for search engines covering a range of procedures such as laser dentistry and porcelain veneers. The new website’s unique features help facilitate strong doctor-patient relationships and illustrate the practice’s emphasis on quality patient care. By collaborating with Rosemont Media’s dental website design team, the doctors are able to showcase their dedication and commitment to their patients. Rosemont Media has implemented some of the the latest and most advanced search engine optimization strategies in order to assure the best rankings across the web. 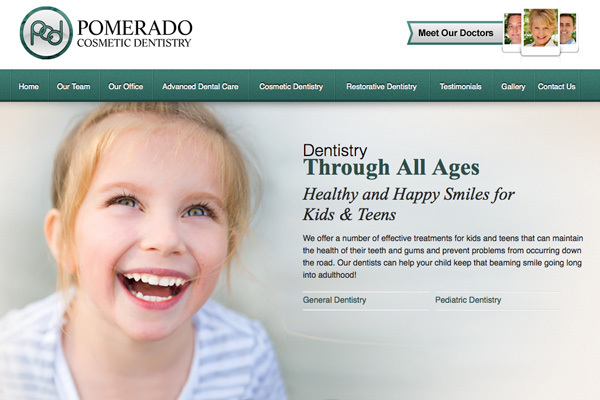 To learn more about the customized website design Rosemont Media can create for your practice, please visit pomeradocosmeticdentistry.com.